In Situ have recently finished working with a University of Birmingham 4th year Civil Engineering student, developing geophysical research relating to the maximum shear modulus values of a soil, for a final year MEng geotechnical project. Seismic cone penetration tests were undertaken before and after the installation of vibro-stone columns to establish the effectiveness of the ground improvement technique, and the feasibility of using geophysics. The two sets of data were compared to find relationships between soil stiffness and shear wave velocities relating them to site borehole results of the soil conditions. The comparison of results was then presented in a technical report produced by the student. We have just completed a research project in Folkestone with a student from Imperial College London. The tracked rig and seismic equipment was used. The aim was to verify a projected geological model of the ground underneath the seismic station as well as investigating the likely shear wave (seismic) speeds in the top few metres of ground. The testing went very well and the resulting data will be used to improve modelling of such station sites, hopefully increasing the safety of sensitive infrastructure in the future. When you think the holiday season has gone for another summer there was just enough time to for a quick break to the Isle of Wight with In Situ’s White Crawler aka Erik. In the South Eastern area of Madagascar, In Situ also carried out a project for Rio Tinto close to the town of Fort Dauphin. The investigation was similar to another project we carried out in Mozambique where we were investigating the density of the high mineral content sands. In Situ has been involved in an exciting project for a new building for Birmingham City University. Our part of the project was to clear areas of the site for Unexploded Ordnance. In Situ have been involved in an exciting renewable energy project at Swansea Bay. The Swansea Bay Tidal Lagoon project is aiming to be the world’s first man-made, energy-generating lagoon, with 250MW of installed tidal power capacity. The project involved carrying out combined CPT and Magnetometer tests at locations in the intertidal zone where the proposed lagoon is to be built. The site is located in the grounds of the Agricultural University of Kamza, about 10 km north of Tirana, capital city of Albania. 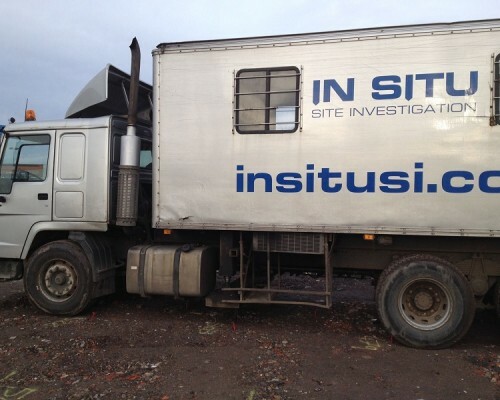 In Situ Balkans carried out a ground investigation for T.T. – Soil & Earthquake Consulting to determine the ground conditions close to the Faculty of Economics, whose building has severe damage in the foundations and cracks in the walls. In Situ was involved in a large geotechnical investigation for one of Rio Tinto’s exploration projects in Mozambique. The job entailed carrying out over 200 CPTs in the densely vegetated jungle of Jangamo close to the town of Inhambane. In Situ carried out an over-water based ground investigation for the client. The aim of this investigation was to determine the ground conditions on the river bed, and the locations for the proposed bridge foundations. In Situ Carried out a project investigating an old clay pit on the putskirts of Telford. The project involved carrying put 136 CPTs to depths between 1 and 10m across the site. The site had been backfilled up to its present level, leaving a relitively flat area for the construction of a housing estate. 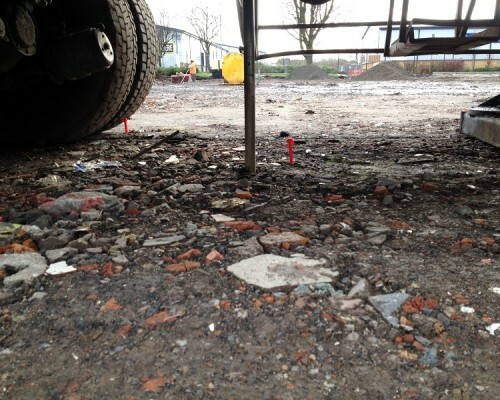 Before the building work commenced information was required regarding the thickness and geotechnical parameters of the variable fill on the site. In December 2013, In Situ Balkans, carried out 7 CPTs and 1 DMT in the area of Golemi beach, in Durresi city, Albania. This was a research project and the client will use the results of the In Situ investigation to study the liquefaction potential of the 7 km long area. In Situ SI carried out a site investigation at Compressor Station CS-03 and Landfall area, as part of the Trans Adriatic Pipeline project (TAP). The sites were both located in the western part of Albania, near the Semani beach. The Trans Adriatic Pipeline (TAP) supports the European Union’s strategic goal of securing future energy supply. TAP will transport natural gas from the giant Shah Deniz II field in Azerbaijan, via Greece and Albania, and across the Adriatic Sea to Southern Italy, and further to Western Europe. As part of In Situ’s continued research into Cone Penetration Testing we have teamed up with the Civil Engineering department at the University of Ireland, Galway and Keller. This site had been identified for the installation for a windfarm, the site was agricultural land and was unsuitable for the wheeled CPT truck, however the blue tracked crawler was perfect for the terrain. 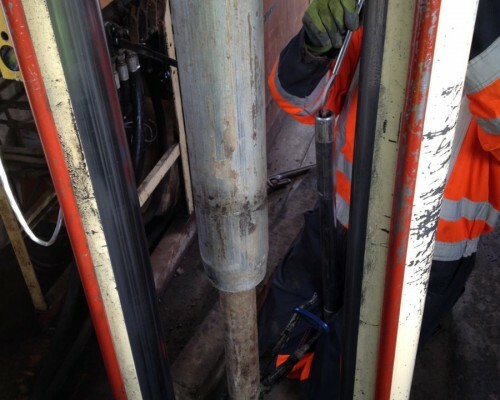 In Situ Site Investigation carried out a survey for a cable route at The Wash in Lincolnshire; the survey was to investigate a cable route from an offshore windfarm.